This month marked the long awaited rebirth of our wonderful cinema, now renamed the Regent Street Cinema. For a long time for staff at the University it was known as The Old Cinema, and has had various names over the years, as will be clear when the book about this, The Magic Screen, is published in June 2015. I was lucky enough to be involved with the book, and also have had some small involvement with the Cinema over the years in various guises, see for example some previous blog postshere and our exhibition Classified. The last few years have seen things really develop apace – a lot of the credit for this must go to our Vice Chancellor – not only has he seen the Cinema as an important project in its own right but has really seen fit to celebrate our heritage, including fully supporting the Archive and our excellent archivists. This was something which had previously been under-acknowledged and utilised and they do some brilliant work – see for example their excellent online exhibition on World War One and the Polytechnic and recent exhibition of gig posters. They have of course also been heavily involved in the Cinema redevelopment. The Cinema itself is a beauty ands hopefully lots of people will come to visit it. Obviously opening a single screen cinema in the West End, and one that whilst it is a commercial cinema also is heavily linked into the University’s educational ethos, which undoubtedly makes it a challenge to programme. That said, the initial programme has been superb – eclectic and imaginative in equal measure, and credit must go to the cinema director, Shira MacLeod for this. The opening night saw the premiere of Lambert and Stamp for example, with Terence Stamp giving a Q&A and in the days since the programme has constantly surprised. I was lucky enough to Chair a Q&A on excellent new film Bypass. Its a hard hitting and great film, and provoked a vehement discussion. There is certainly a political element to it, and the team behind it were very keen to ensure it was released before the election. As it happened we screened this a week after the election, and the Q&A commenced almost exactly a week after the polls had closed. We were privileged to have Samm Haillay, the Producer; David Procter, the Director of Photography, and Noel McLaughlin, a media academic and massive supporter of the film in attendance, and the first question, based upon this post election scenario, elicited some passionate audience responses. In fact, we did not have much time for any of the other questions I had prepared (including some classics on genre bending, finance and a discussion of Director Duane Hopkin’s father’s statement that ‘academics don’t live in the real world, they are either mentally or sexually frustrated’ that I was going to put to David and Noel, the 2 academics on the panel) and as much of the discussion was taken up with audience and panel thoughts on how the film fitted into this and some debate around who the audience for the film was and whether it could reach further. The consensus was that it was an important and passionate film that deserved, and needed, to be seen. The point was also made that it was beautifully shot and it was a privilege to have David in attendance although time constraints meant we could not drill down on this during the Q&A, but luckily we eventually found somewhere to carry on the discussion afterwards, nothwithstanding the big queue at theSocial. I’ll post on the Cinema again as its journey continues, and really hope that as many people as possible get to visit this historic space and see some of the brilliant films we are screening. 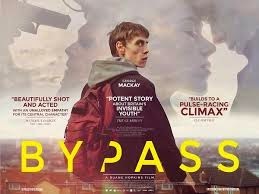 Also, try and catch Bypass – whilst I read it as a film about hope, Samm wanted it to be seen as a call to arms, and reflecting on it again I can see this as a clarion call and a touchstone for a different sort of hope. I’ll end this as the film does, with the quite marvellous Soldier On by Richard Hawley and with a thought for the late Chris Collins, to whom the film is dedicated. Fred Wistow is a consultant to and director of several non-profit organizations and a contributing writer to a periodical for therapists. A long time ago, in a galaxy far, far away he was the Executive Vice President and General Counsel of Time Warner’s Music Group. Fred will be the moderator of the session. Evan graduated from UCLA and was admitted to the California and Federal Bars in early 1968. He has represented clients as diverse as Warner Bros. Pictures, Warner Bros. Music Publishing (now Warner Chappell Music Publishing), Colombia Pictures, Geffen Kaye Music Publishing, and Windswept Pacific Entertainment Co, as well as many successful songwriters, producers and record companies. In 1991, he took a position as the CEO of Windswept Pacific Entertainment Co. and subsequently, its successor entity, Windswept Holdings LLC. Evan has a dual role in the negotiation as seller and M&A counsel. Chris Ancliff joined Warner Music Group in 2009 as General Counsel, International, WMG. In this position he has responsibility for all of the Group’s legal and business affairs activities outside the US, working closely with WMG’s recorded music and music publishing affiliates throughout Europe, Asia and Latin America. Prior to this, he was Vice President at EMI International, rising to the position of General Counsel, EMI Group, in 2007. During his eleven-year tenure at EMI, Ancliff eventually became responsible for all aspects of the company’s legal and business affairs activities including mergers and acquisitions, artist negotiations, litigation and industry issues. Chris is acting as the buyer in the negotiation. John T. Frankenheimer’s practice is centred in the entertainment and media industries, with emphasis on both institutional and talent clients. He also represents writers, producers and directors in both film and television, as well as various technology and media companies. Mr Frankenheimer speaks frequently on topics related to entertainment law and has given presentations at numerous universities as well as numerous industry sponsored events and seminars. John will be acting as the buyer’s M&A counsel. Charles Bradbrook has been advising clients in the media and entertainment sector for over 30 years. He is currently a partner in SRLV, a media specialist accountancy practice, prior to this he was a partner in Deloitte. Charles has advised on a number of transactions involving the purchase, sale and restructuring of a wide range of independent recording and publishing companies. This has made him an expert on the issues that affect the owners of those companies both from a commercial and tax perspective. Charles will be undertaking financial due diligence and providing tax advice where necessary. Robert is an Associate Fellow at Westminster Law School and was a partner in the Commercial Group at Simkins LLP. During the first 20 or so years of practice Robert was a music talent lawyer specialising in the negotiation of recording music publishing and management contracts on behalf of his artist clients as well as the internal legal organisation of the bands that he represented. During those years Robert represented many household names, including America, Mike Oldfield, Dire Straits, Wham, The Average White Band and The Scorpions. More recently, Robert’s clients have included EMI (who he represented on a number of transactions including the acquisition of Chrysalis Records), Filmtrax, Virgin Records and Virgin Music Publishing. Robert also worked in connection with the proposed – but ultimately aborted – merger between EMI and Warner Music Group. He represented EMI in respect of many complex corporate issues following the acquisition of Terra Firma by EMI. Robert will be undertaking copyright and contractual due diligence. Robert also undertook the enormous task of organising the event, and without him this would never have happened! More information and online registration for once in a lifetime: a mock negotiation of the sale and purchase of a music publishing company.